For those of you eagerly awaiting your gigabit fiber-to-the-home broadband service, check out the third annual report from the Gig.U effort. The report, which came out on Monday, shows how much has changed in the three years since Gig U. was created as a means to bring gigabit connectivity to university towns. Like us, the creators of the project believe the future is in fiber and faster connections. And while the report is very clear that many of these projects are still in the planning and press release stages (I call it gigawashing when I’m feeling frustrated) it offers a nice rundown of all the projects currently happening. And reading the report, it’s clear there are two things driving the expansion of gigabit services. The first is a willingness by municipalities to act as a partner, not an impediment, and work with providers to get fiber in the ground acting . And the second is competition. 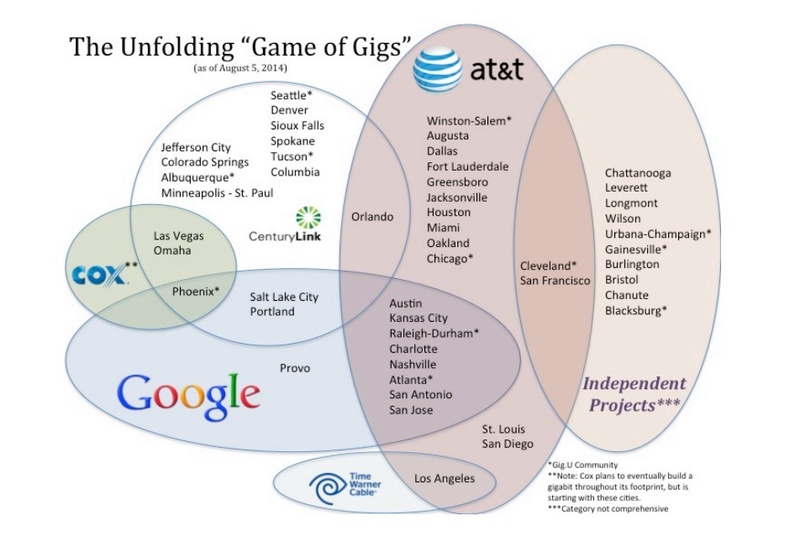 As the chart above from the Gig.U report shows, there are few cities getting a gig from one provider. The report credits [company]Google[/company] with promoting the idea of a gigabit service and getting communities and consumers excited, but it also has galvanized the incumbent cable and telco providers to upgrade their networks (or at least promise to upgrade their networks). So while, we’re not anywhere near gigabit service in every community, or even in most of the communities listed in the chart, we’re getting closer, and it’s because Google unleashed some real competition in the market. And frankly, as the FCC and the FTC consider the upcoming purchase of [company]Time Warner Cable[/company] by [company]Comcast[/company], they should note that so far, Comcast isn’t a name on this particular diagram. I also don’t see Cspire’s Gig initiative in Mississippi listed above. The reason gigabit networks are being built in the U. S. is that we have a regulatory model that provides carriers with both the incentive and the ability to compete with each other on the basis of performance. We encourage carriers to bring any sort of service to market that they believe they can sell, while Europe and East Asia leave infrastructure to a monopoly and require regulatory approval for new wiring. The biggest impediment to gigabit networks in the U. S. is lack of consumer demand – most people who use broadband networks don’t even know what their download and upload speeds are supposed to be – and the second biggest barrier is the difficulty of obtaining access to rights of way and permits. Google convinced KC to lower regulatory barriers, and the other cities can now see that local policies are an impediment that they can remove. Many “independent” projects are left off, and if the community-owned projects that are already delivering Gig service were included, it would abundantly clear that community-owned projects are the majority, not another minority. Find it interesting to see the sentence “act as a partner, not an impediment” applied to local governments. It is more accurate to ask the big incumbent operators to act as a partner rather than an impediment. The idea that local governments are somehow holding back a tide of investment in gigabit networks is utterly absurd. Actually no, it’s completely factual. Local municipalities who own the electric company have a history of charging ridiculously high pole attachment rents to cable, telephone, and broadband companies. This was the case in KC and Austin until Google niggled them down. This allowed telcos and cable companies to demand the same concessions Google got and use them to build their own GPON networks. All these fiber networks use a technology that Verizon developed for FiOS, BTW. We need far more competition, in the UK we have a monopoly, with just one other provider in cities, and that one provider (virgin) is the only reason we are not all still on dial up. The vast majority (over 90% of the land mass) have no virgin access, and so are still on dial up or satellites or very slow internet on phone lines. Its all a superfarce. We need fibre. Moral and optic, and yet our government is still subsidising the old phone network instead of investing in new infrastructure. Bring on the altnets. I’m hoping Google moves eastward and provide service in the City of St. Louis. Having picked up some info about Google in the KC area, I still have questions about the necessary equipment. What sets Google apart from AT&T is fast speed both ways. While offering Hi-Def video and also watching wil be greatly improved, actual 4K supposedly requires a 200 MPBS. Didn’t see Lafayette, LA mentioned. It’s a cautionary tale that should be noted. But cities can take matters into their own hands, so far. Was going to mention this. LUSFiber offers gig for 129 stand alone and price drops if you bundle with tv and phone services to as low as 69 a month. Cox is also offering gig here now in certain areas and up to 10Gbps for businesses. Nothing cautionary about Lafayette’s experience. The wikipedia article was written by a fervent opponent of the project (the fiber411 mentioned in the article) and needs radical editingâ€”for example the fiber411petition lost legally due to insufficient signatures and the court found that the city was using the correct law…even with biased BS in the article there is nothing there that would other cities should view this as anything other than the first major success against the national telecoms and cablecos. The community won the battle. LUS Fiber is now a going concern able to pay all its bills and all its bonded indebtedness. And the people get what they voted forâ€”a locally owned utility that can compete with the best of them and is offering their citizens a gig without going begging to the big guys. I agree Lafayette is a success story. The caution for municipalities is that the incumbents will fight every step of the way, rather than just step up and provide the needed level of service. And one of their current tactics is getting state level legislation of prohibit local governments from establishing such services. It’s just amazing the mental gymnastics elected officials can go through when offered campaign donations. Very telling that the only major providers in the diagram are AT&T and CenturyLink. No Comcast, no Verizon, and TWC is barely a blip with one market. Also telling that most of this investment, outside of Google and blips from Cox and TWC, is coming from DSL providers which have lagged Cable for a very long time. Finally, RST Fiber is building out Gigabit in NC and has started work in Raleigh, so I think that raises the odds for a competitive build out in the area.